This is the first opulent work gathering many of the top brand names in the ambient society and bringing them together in a promotional endeavour that may benefit the participants with an enlarged fan-base aspiring new listeners, whilst also offering new and alternative interests in previously unheard bands/projects to the individuals who have taken the time to download this release. 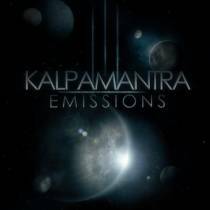 Kalpamantra’s concept behind its releases is based on the Nakshatra, the lunar division constellations conceived of by 27-28 stars in its system, which will be represented in a different method via this agency, releasing compilations in the numerical order and value of its basis. Regarding ‘Emissions’ actual inner concept, the extensive tracklist has been separated and cast into five chapters; these chapters correspond to the five circumpolar constellations. They are ‘Ursa Major’, ‘Ursa Minor’, ‘Draco’, ‘Cassiopeia’ and ‘Cepheus’.